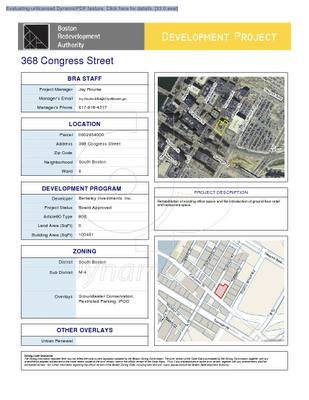 Fort Point Boston Blog: Hotel Project at 368 Congress St.
(the “Previously Approved Project”), which was approved by the BRA Board on April 1, 2008. The Proposed Project contains approximately 103,000 square feet of gross floor area on six floors. larger one-bedroom and suite-style rooms in order to provide a range of lodging opportunities.